This is a follow-up to the previous article on Kenting during Spring Scream, where I described how I managed to reach the small town. This entry covers Friday of Spring Scream 2008 weekend (April 4, 2008). On Thursday night in Kenting, I spent my time in town, relaxing like I would in any resort town. 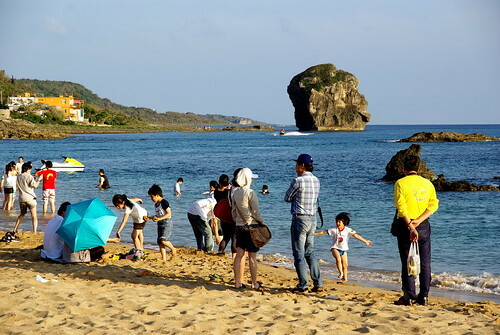 Kenting is a small small town, where there is little action outside of long weekends and holidays season. 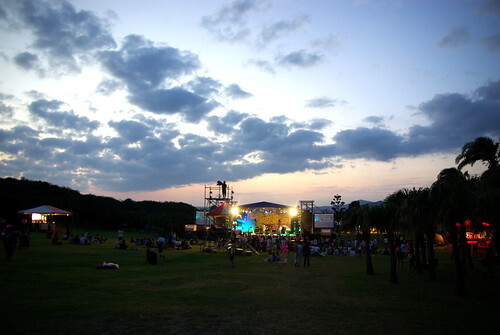 The largest town nearby is Hengchun, where many people descend to Kenting. According to my host, you will find cheaper deals and better quality for food in Hengchun. I just saw how it looked like on the way in and out of Kenting, and it looked like an ancient 19th century Chinese town, like I’ve seen in Muar, Malaysia, and then Kaiping, Guangdong, in China. It was a pleasant Thursday night. The sea wind was picking up quite a bit by the end of the evening. It was very refreshing. On the next morning, Friday, I finally saw the sunshine high in the sky, after it disappeared from my sight a few days earlier when I arrived in Hong Kong and on. After spending most of the day in Kenting town, updating this blog entry for Bandeapart.fm (in French), I started heading out to the lighthouse at Eluanbi, sometime around 4:30PM, after stopping for an hour at Chuanfan Rock, 1/4 of the distance from Kenting town. I was a little unimpressed by the initial crowd, as well as the band (a British act). After wandering for a bit around the main stage, I decided to walk up the small hill, from which point I took the first picture of this article. Beyond the lighthouse, sitting tall atop the hill, there are 6 or 7 smaller stages, mainly for local or small bands to perform, with a crowd of 50 to 100 each in front of each of them. 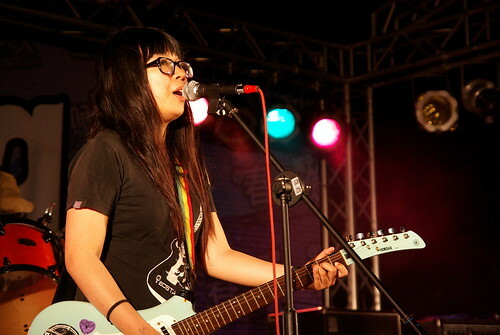 The sun had just set when I reached the other side of the hill, and when I heard Orange Doll (橘娃娃 – see photo), an indie pop band from Kaohsiung. It sounds exactly like what I like of Asian indie that I’ve learned to like in the past few years. After this, I walked past another band called Ferris Wheel, and one called Braces, from which I bought a self-published EP. On the slightly larger South Stage, there was another band called Cherry Boom. On the way back, there was a band called Alice Tears. 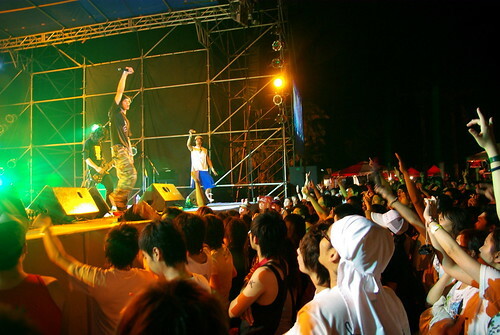 I also remember hearing a Taiwanese reggae band! One of the very interesting thing, and it may have been nothing more but a statistically-sound coincidence, but at least 75% of the 7 or 8 bands (and all of those that I named) that I encountered during the next two hours were girl-fronted! Ferris Wheel and Braces and Cherry Boom were all-girl bands too. On my way back, I was a little tired of my day, and napped in the grass, half-listening to Penny, in right field of main stage, reading the messages below the screens at each side of the stage, spurted by spectators sending SMSes with their Nokia (an official sponsor of Spring Scream, and also of competing festival Spring Wave). The most entertaining band of the night was certainly 88 Guava Seeds, which describes itself as rock alternative, but which could’ve also been ska. In any case, it’s a rock band! They were loud, funny and in a very chatty mood (especially their leader, see photo). 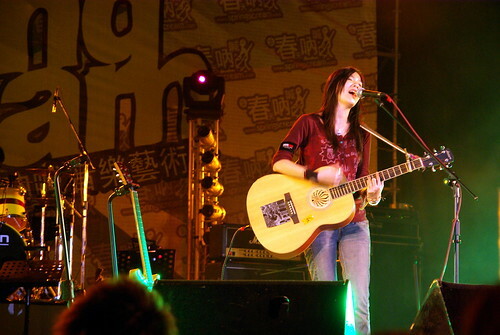 The next singer was Deserts Chang, also known as Zhang Xuan in pinyin. Chang was the first artist that I was able to recognize from music previously heard. I only knew what was her first two albums released in 2005 and 2006 (she has a new album in 2007). The feeling of finding something familar, in the songs that I knew, yet foreign, because sung in a language that I did not master, was one of comfort. What was previously hypothetical (through YouTube and mp3s) was suddenly tangible, an actual 5 or 6 meters from me! It became even truer when I went to Cheer Chen’s concert the evening after. 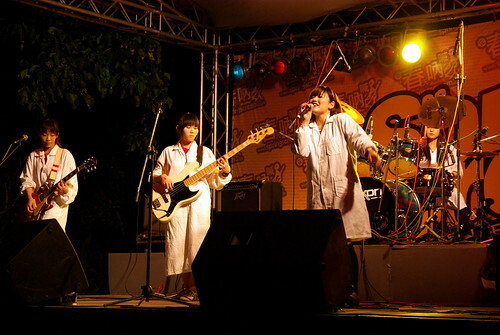 While Deserts was at times mellow, at others melancholic, the next band, Overdose was just mostly angry, but sung in the local language, Mandarin. They did all the mimics that you would expect from your favourite angry teen act, and this was also a strange strange experience. Where did it come from, and are local scenes (the Taiwanese one, here) not just carbon copies of the more considerable Anglo-American scene? It was at that point, I think, that I met two Vancouverites, a brother living in Taipei, and a visiting sister from Singapore (or maybe Bangkok? ), with their expats friends from Taipei. They squeezed through the crowd, which certainly enlarged itself vastly before 88 Guava Seeds, were too tall to stay in front, and went back the way they came from. 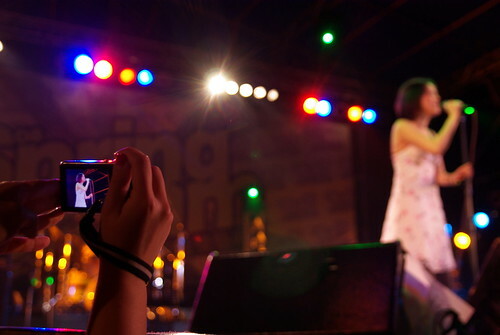 Finally, we completed the night with Faith Yang, which was the big star completing the lineup this first night. Unlike the Spring Wave, Spring Scream decided to keep its biggest bunny for the end, rather than have it at the middle of the night. After the show, I promptly picked my bike, parked on a tree outside of Eluanbi, and biked back the 6-8 km to Kenting. Up to that night, it was the scariest bike ride ever. The road to Kenting is a provincial road, hopefully two lanes on each side. But being a provincial road, it was in the dark for long stretches, with little space on each side… This was a part that I should have documented (audibly, it is somewhere in my stuff), but I was more busy making sure that I got back to Kenting in one piece. Once in the outskirts of Kenting, the town became the party town that I was expecting. Now, even the scooters (and bikes) were stuck in traffic, between cars, and people browsing street-side stalls. People did not care about trash. 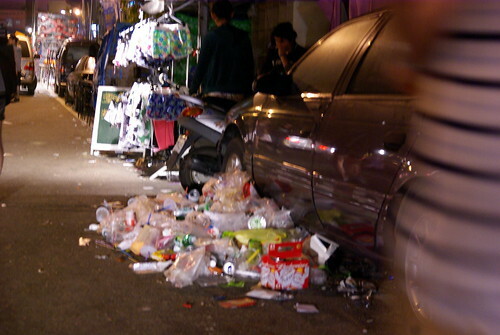 For the next few days (or weeks) following Spring Scream, Kenting is a mess, and no one other than the city pays for the cleanup. 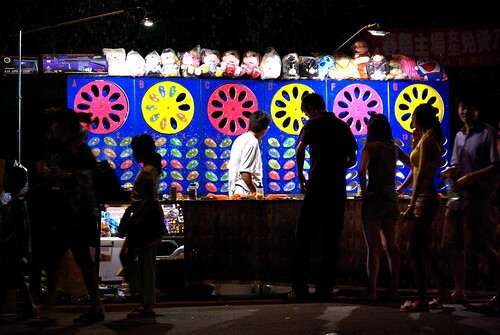 Late at night (it was maybe 1AM when I got back to Kenting), business is still rolling along the streets of Kenting, as young people drink, eat and are having fun. 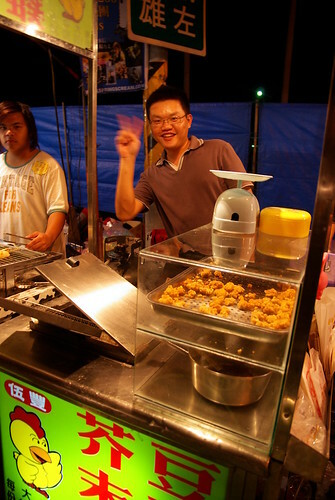 I have a list of the food products sold at the night market (and maybe more or less similar across Taiwan), which included meat kebabs, bread dogs, but also duck heads and bugs, but it too long an entry already for tonight! 2010-03-31 明天去墾丁！Tomorrow I’m going to Kenting! Je vais à Kenting demain !